There are two ways to schedule your appointment. Select the one that best suits your needs. Option 1 is for you if you still have a copy of your emailed receipt. Option 2 is for you if you no longer have a copy of your receipt. Click on the word Schedule in your email. Adding Images; canceling; or rescheduling your appointment. If you no longer have access to your receipt, there is a direct link on my website where you can schedule using your email address. I suggest bookmarking this page for future reference. 2. A page will open online in a browser window for you. Your Code is already inserted in the box that says Code or Email. (If for any reason it is not enter YOUR email address that was used when you originally paid.) Hit Apply. If for any reason your email address is not found, you have entered the wrong email address. Enter the correct email address and try again. 3. Scroll to the bottom, set your time zone if it is not already set, and click Set time zone. 4. A small calendar will appear. the number will appear with a little green box around it. 5. Available times will pop up. Select your preferred time. Hit Continue. 6. Enter your details and images on the next page. you will be able to upload them up until 3 days prior to your appointment. 7. Click Complete Appointment at the bottom. 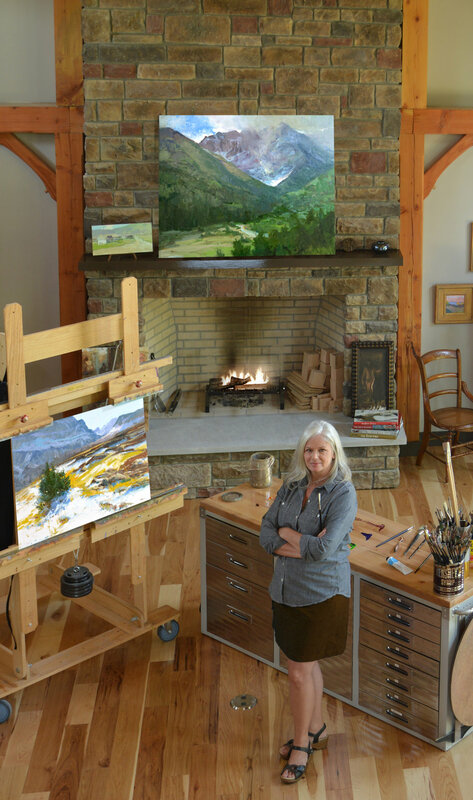 You will receive an appointment email from Putnam Fine Art Studio with your appointment confirmation. By clicking on view appointment details, you will be able to add images, cancel, or reschedule your appointment. 8. Once you click on view appointment details in the appointment email, a new browser window will open with your details and you will see several options. When you are ready to upload your images, click Edit Forms. (This is also where you can cancel or reschedule appointments). NOTE: You may reschedule or cancel your appointment up to 24 hours prior to your appointment time. 9. Scroll down and click Choose File under Painting Title 1. 10. Select Files to Upload and find images on your computer. (Or, drag, drop, or copy and paste files in the gray area.) Click Upload. Repeat for Painting Title 2. 11. Enter specific things you would like to talk about under hurdles you are facing. NOTE: You may make changes to your form anytime within 3 days of your appointment. I suggest bookmarking this page for future reference. 3. Enter YOUR email address that was used when you originally paid in the box that says Code or Email. Hit Apply. Please enter the correct emailed address and try again. 4. 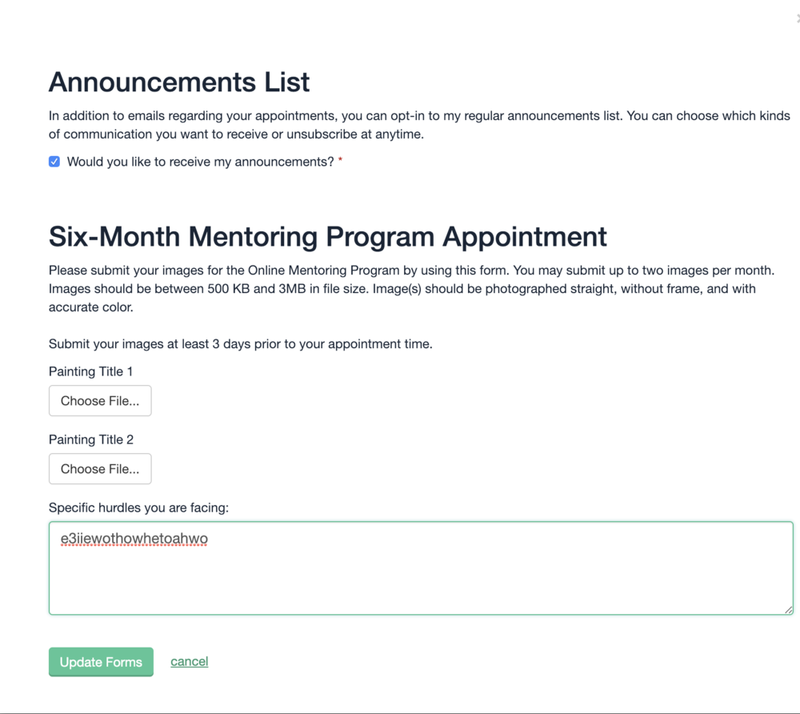 Under Online Learning, click inside the Mentor Program Appointment box. and steps 8-12 in Adding Images; Canceling; or Rescheduling Your Appointment above.